"A thing of beauty is a joy forever. It's loveliness increases; It never fades. 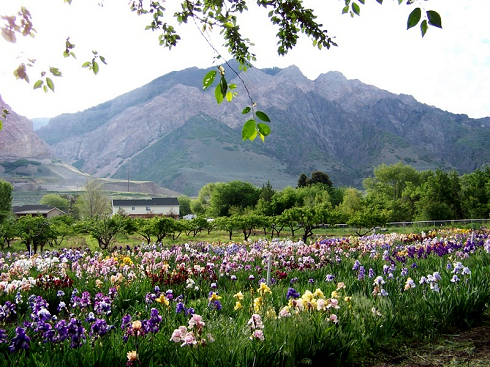 Nestled at the foot of the majestic Twin Peak Mountains in Willard, Utah, Neal and Dawn Mumford have their own little heaven. 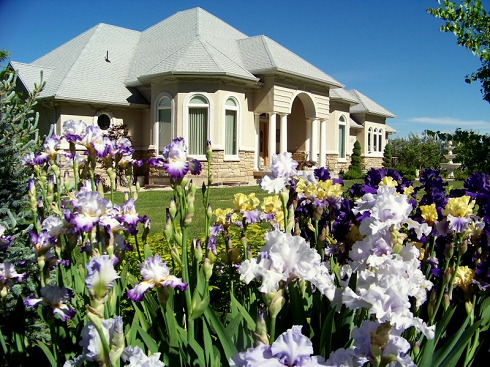 Their beautiful, spacious "do-it-yourself" home is situated on a 5 1/2-acre lot. 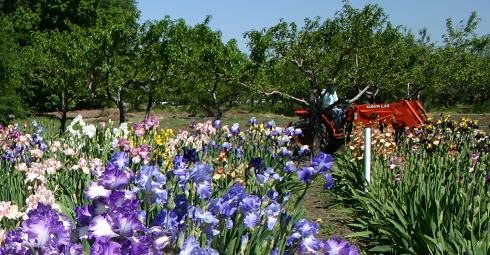 Their orchard has about 300 apple trees of 8 varieties. They also have peach, plum, and sweet cherry trees. 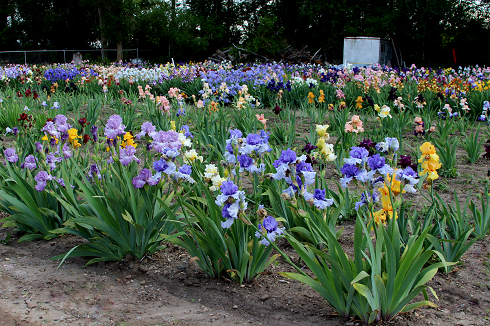 It is the perfect setting for their (at last count) 361 tall bearded irises. 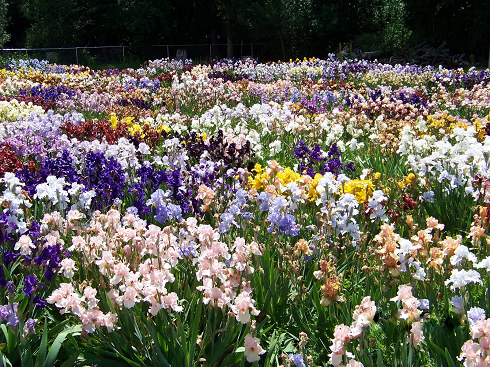 The irises are on 1/2 an acre in rows 75 feet long. Neal plants 2 fans back to back so they don't grow into each other, and then plants 2 more of the same variety 36" apart in the same fashion. 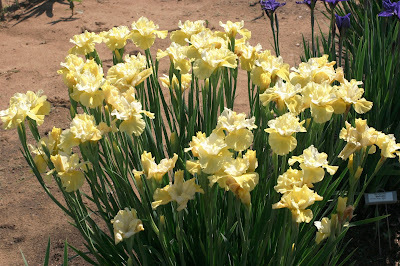 This gives them a nice-sized clump in 2-3 years. 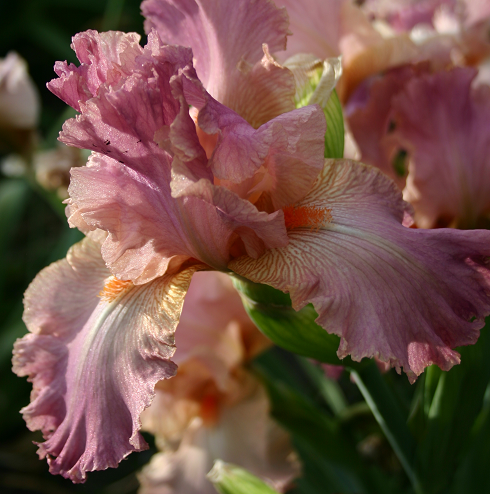 "Conjuration," (also below) "Silverado," "Edith Wolford," "Dusky Challenger"
I met the Mumford's through our common love of irises several years ago, and have enjoyed a special friendship since. 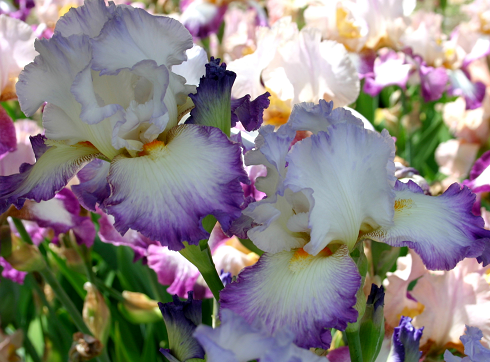 (You meet the nicest people through irises)! Neal and Dawn's love affair started with their first date to Jr. Prom in High school. They will celebrate their 45th wedding anniversary this November. 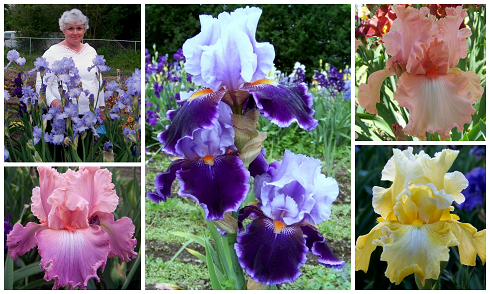 Their love affair with irises started 43 years ago, with rhizome starts from Neal's mother in 1970. They have been actively collecting and trading since 1984. 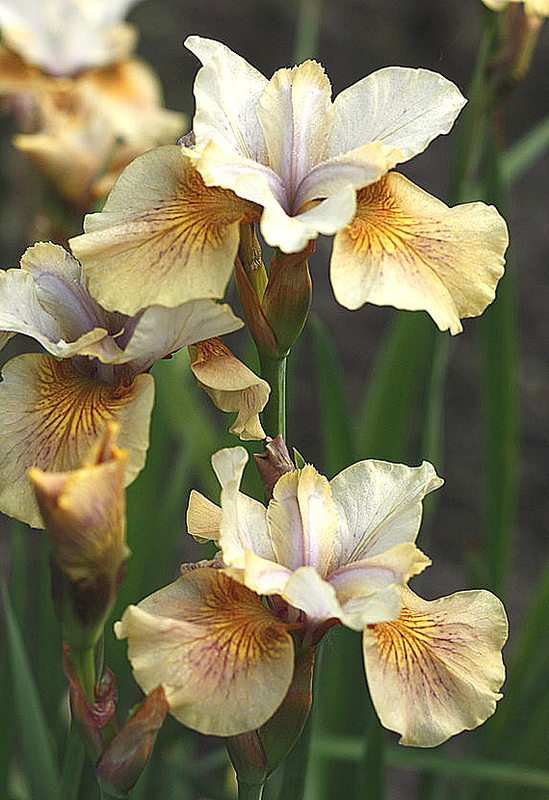 They have ordered exclusively from Schreiners and Cooley's, as well as traded with iris friends. 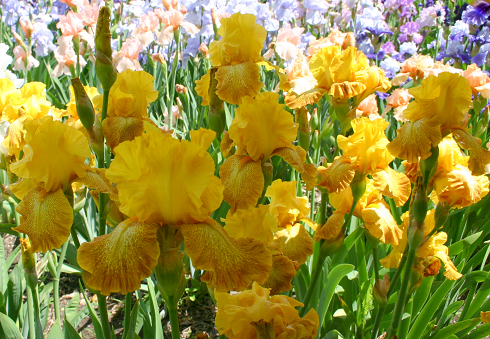 Helen Larsen, a local woman known for her irises, was an influence and contributor to the Mumford iris garden. 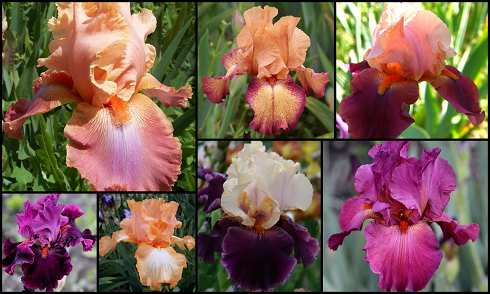 From top left: "Piping Hot," "Autumn Leaves,"
from front "Crowd Pleaser," "Gigolo," "Barcelona,"
"Golden Panther," "Orangutan Orange," "Kilt Lilt"
Rebloomers: "Champagne Elegance," "Best Bet," "Clarence"
Forefront: First year blooms of "Yaquina Blue," "Crowned Heads"
Dawn orders around 7-10 rhizomes a year. 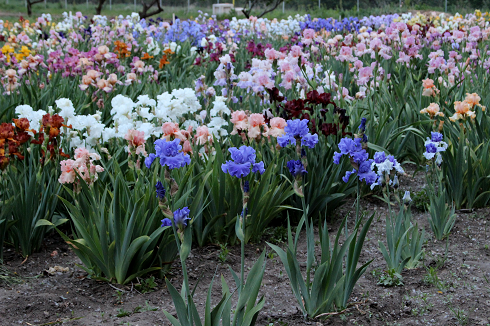 Because of the number of iris they have, they rotate the dividing and transplanting, dividing 7-9 rows a year. That way, every 3-4 years all the rows end up being transplanted. 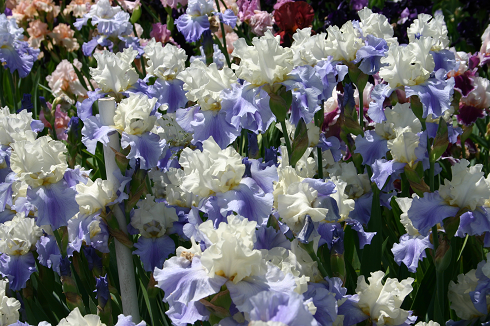 In the garden, there are rows that may be 1 year old, others are 2, 3, or sometimes 4 years old. 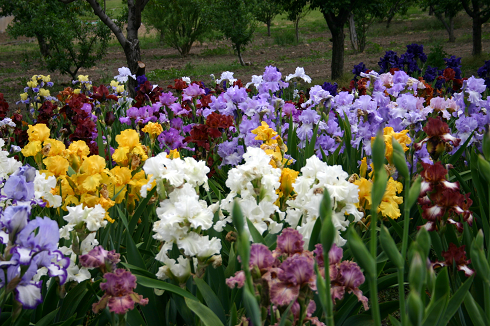 They have found that division every 3-4 years is best for optimum iris blooms.They also have what they call their "share bed," which are rows of irises they can share with others as they come to view the iris, which ensures that those people can get the rhizomes of the irises they want. Front left to right: "Feature Attraction," "Aegean Wind." 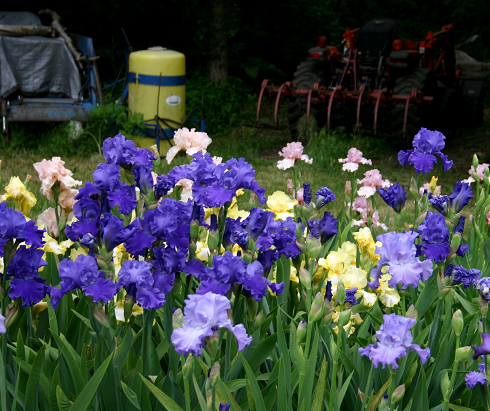 Picture shows 2nd, 1st and 3rd year iris plantings. 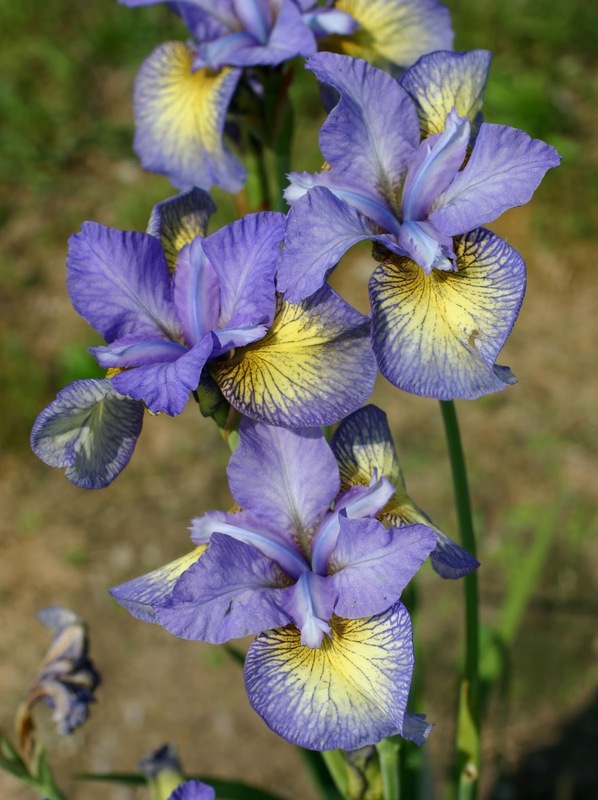 They share some of the things they've learned over the years of successful growing: When they divide their iris, they transplant the rhizomes with 1/4 cup of superphosphate.They flood irrigate every 8 days. Dawn says that they use a well-balanced fertilizer, used at 1/2 strength, 3 weeks before bloom, and then again 3 weeks before winter, in late fall. In their location it is best to divide and plant irises in August. 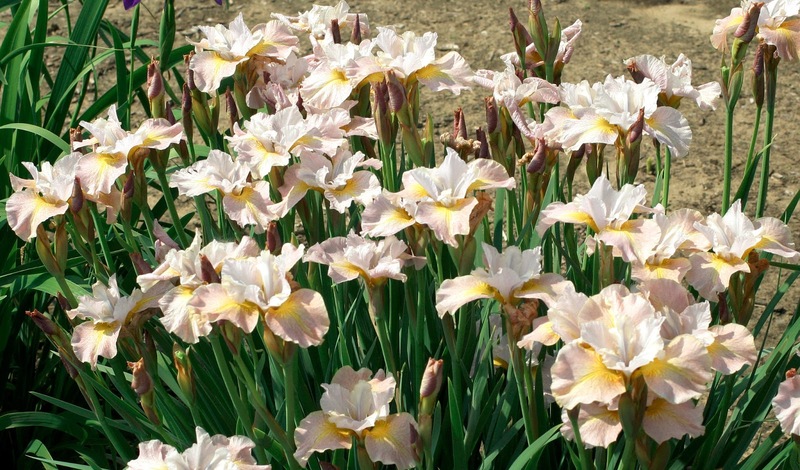 Dawn says the reason for their large, healthy blooms is great location; the rocky soil provides superior drainage. 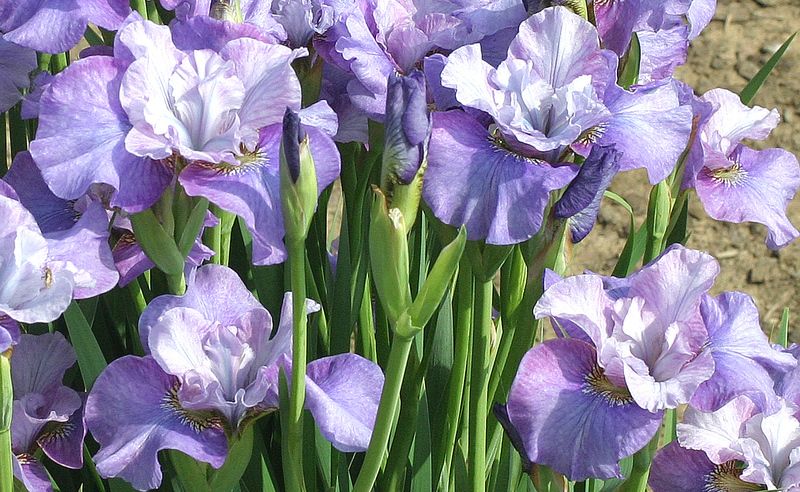 The iris benefit from the nutrient-rich orchard soil as well. Neal uses a liquid pre emergent, Trifluralian 4EC, after September 13 in the fall, for grass and weed control. A spring application is also recommended. 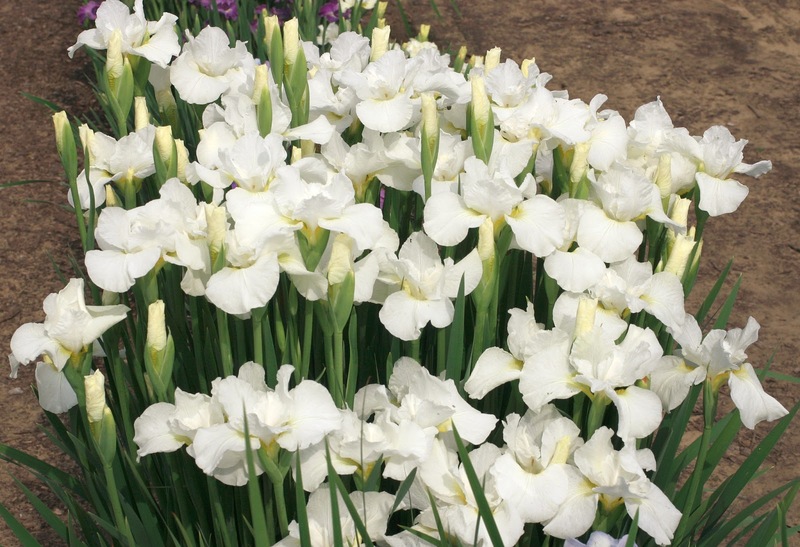 Additionally, they don't trim the foliage in summer or fall unless they are transplanting; they feel the irises do better. 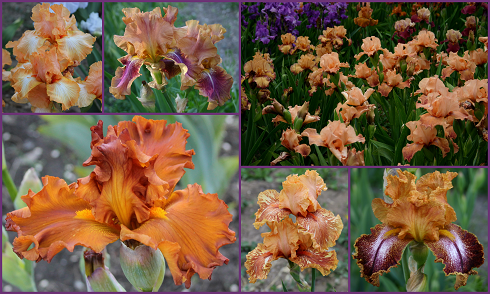 Stunning Clump of "Stairway to Heaven"
Dawn tells the story about the irises "Purple by the North Fence" and "Yellow with the Orange Beard." 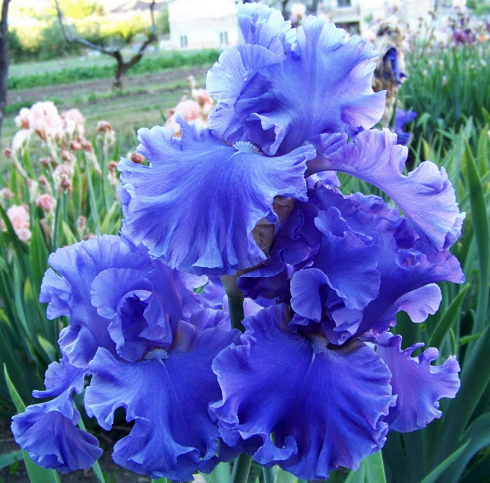 She said a friend who was getting older couldn't remember the names of the irises, and had named them that. 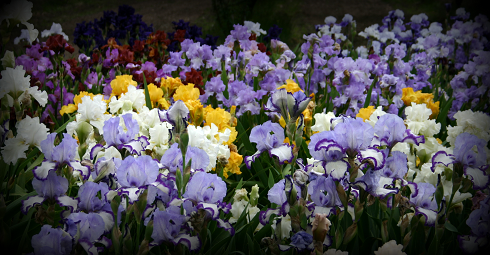 After more than 25 years, they are still known by those names in the Mumford garden. 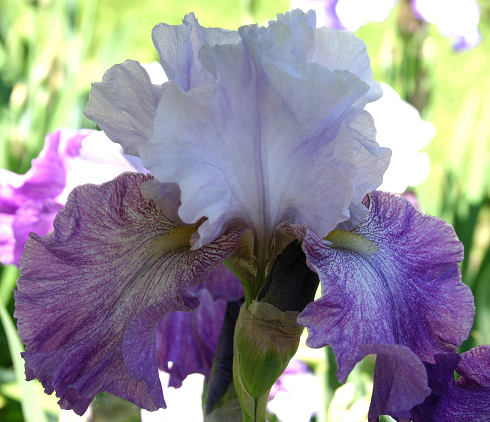 Another story was the time Dawn was dividing the iris. She was trimming the fans and writing the names on them. 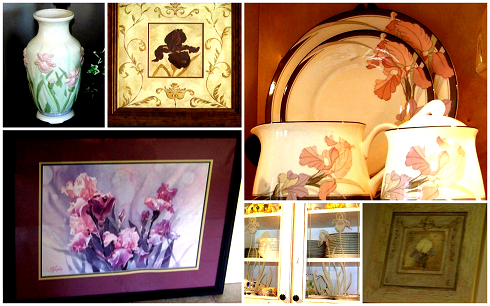 The little girl next door ran home and told her mother that Dawn was "giving all her flowers a name." 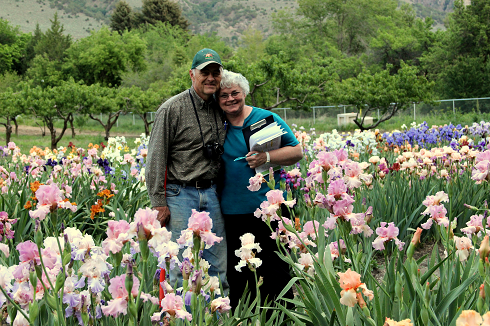 When they moved from their home in Brigham City 8 1/2 years ago to their present home, moving the irises was no easy task. They lost some, and many others' names were lost. 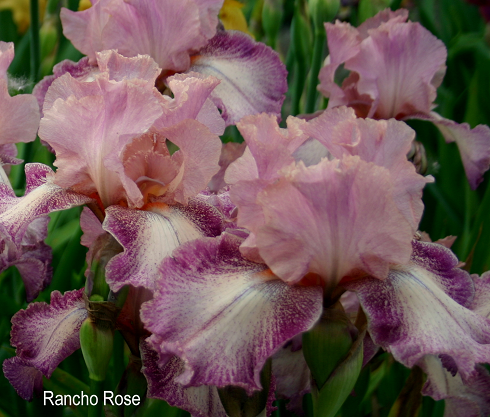 It has been a real job researching, and correctly naming the iris. They have made real progress, and are close to identifying them all. The hardest winter Dawn remembers is the one of 1985, where the temperatures plunged to 65 degrees below zero. They lost 23-25 irises that year because there wasn't a blanket of snow to insulate the plants, causing the demise of the iris. Dawn is interested in finding those irises that she's lost over the years and is hoping that someone reading this article can help her in acquiring them. (See her list at the bottom of this article). (From front to back) "Angelique" "Pledge Allegiance,"
They've done nearly all the work in their lovely "do-it-yourself" home. 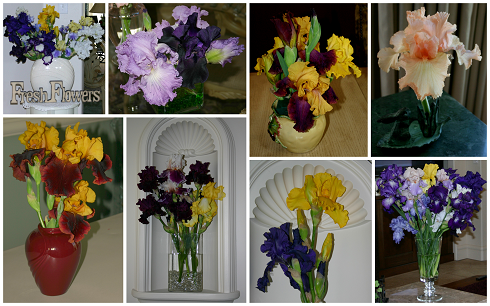 It features arched alcoves for iris floral arrangements, special vases collected for the arrangements, a sandblasted etched glass in the china closet with images of irises, Noritake iris china, and a watercolor print from Cooley's-- all reminders of their love affair with irises. 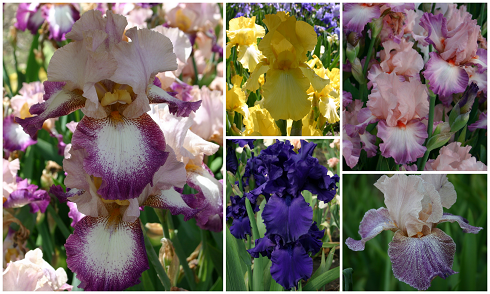 For years Dawn hosted a luncheon for as many as 58 women during iris season, with floral arrangements throughout their home, and, of course, a tour of their colorful garden. Dawn with "Many Thanks," a Cooley's bonus plant. 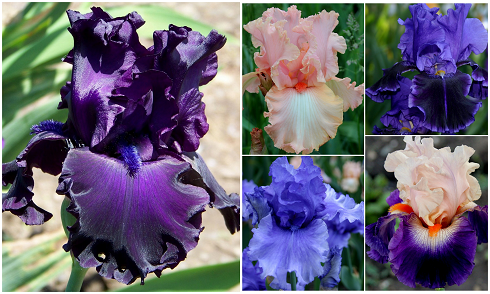 More Favorites: "Schortman's Garnet Ruffles,"
"Many Thanks" in 2009, and "Silverado"
Among Dawn's favorites: "Night Ruler," "Electrabrite,"
thinks should be named "Faded Denim"), and "Gitano"
A favorite blue of Dawns: "Sea Power"
More favorites: "Salzburg Echo," "Company Red," "Aegean Wind," "Feature Attraction," and "Kitty Kay"
Neal's favorites: "Change Of Pace," "Well Endowed,"
"My Ginny," "Dusky Challenger," "Rose Tattoo"
From l to r: "Victoria Falls," "Jessie's Song," "Sunday Chimes"
"Art Center," "Gigolo," "Barcelona," "Machismo," "Piping Hot," "Crimson Snow," "Mulled Wine"
"Pink Angel," and "Launching Pad"
My favorite red that day: "Dynamite"
I love the delicate colors of "Heather Cloud"
"Tarlatin," a favorite pink with wonderful lace and ruffles! 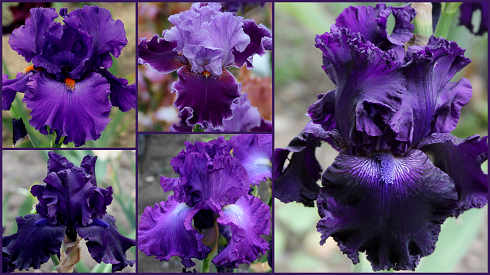 Among Dawn's favorite purples: "Paul Black,"
"About Town," "Night Ruler," "Aristocracy," "Hollywood Nights"
cards printed up from this picture. 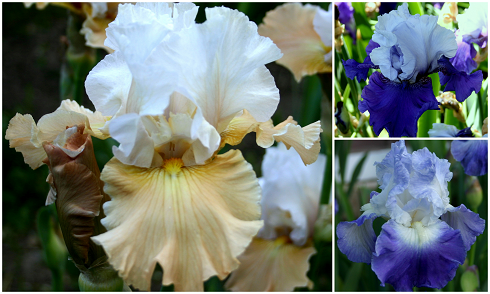 Front to back: "Lovely Kay," "Gold Trimmings," "Pledge Allegiance"
view the spectacular show the iris put on! affair that has increased over the years. 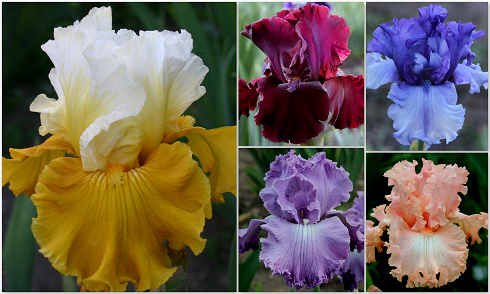 And, of course, the iris never disappoint! Well, it ended up just fine after all! It turned out that postponing the 2012 Siberian-Species Convention until this year was a good decision (and, since it was an unprecedented move, it took a little nerve to do it). 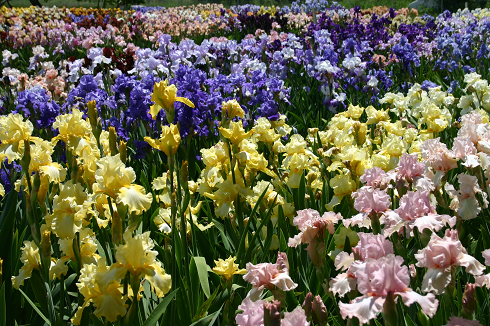 The 128 people who registered enjoyed some very pleasant Michigan late spring weather and caught the irises at or near peak bloom. The arrangements went ahead quite smoothly and more than a few people said it was the best convention they had ever attended. So luck was on our side this time. 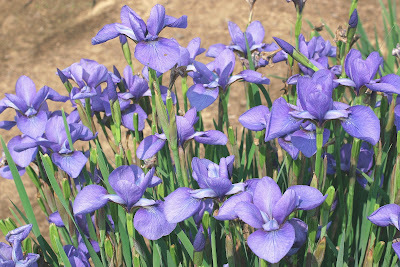 The guest irises were generally growing quite well and at John and Jean Kaufmann’s garden in particular there were many clumps of enormous size after four years in the ground. 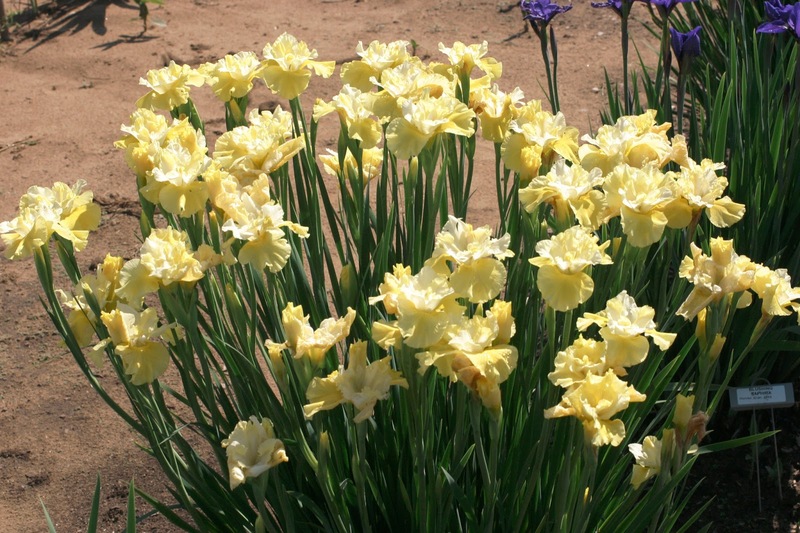 A sandy soil, generous fertilization and an irrigation system brought out their full genetic potential. I don’t recall ver seeing Siberians being grown better.. The other gardens on tour were at Jill and Jim Copeland's, the Ensata Garden of Bob Bauer and John Coble, and ours. 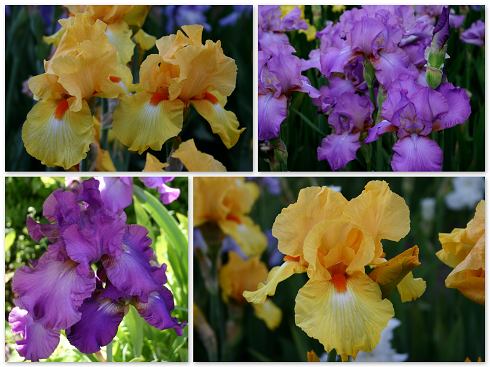 The many fine clumps led to some real competition in the voting for favorites at the end of the convention, and some quite wonderful irises didn’t make the final list. So let me share the final outcome and some photos with you. Listing the Favorite Siberians may seem self-serving since one of mine, the plicata-like tetraploid “Judy, Judy, Judy”, named for my wife, was voted overall favorite – but keep in mind that this was a home game for us and maybe having Judy, Judy, Judy‘s Tearoom serving English afternoon tea to the garden visitors could be seen as a less-than-subtle hint on how to vote. The next iris in the voting, Marky Smith’s “Star Lion”, is a perennial favorite and grew beautifully in several gardens. 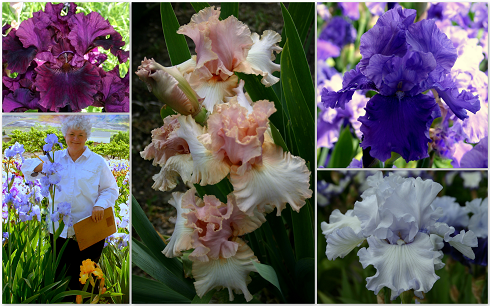 For someone who pays only passing attention to hybridizing Siberians, Marky has a remarkable record of success. 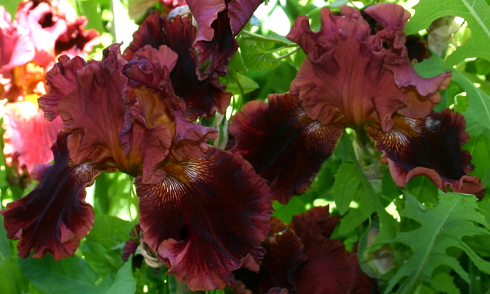 Her deepest red-violet “Kilauea” also made the top ten list. 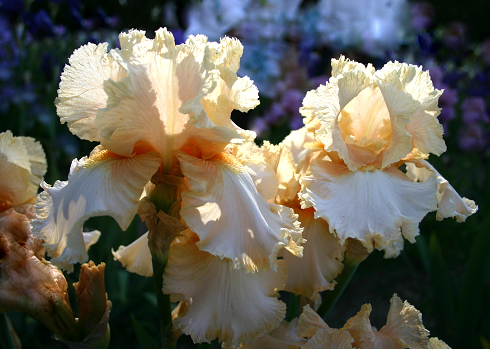 Our “Swans in Flight”, a very large white diploid, and Sylvia Borglum’s “Sylvia’s Love” followed on. 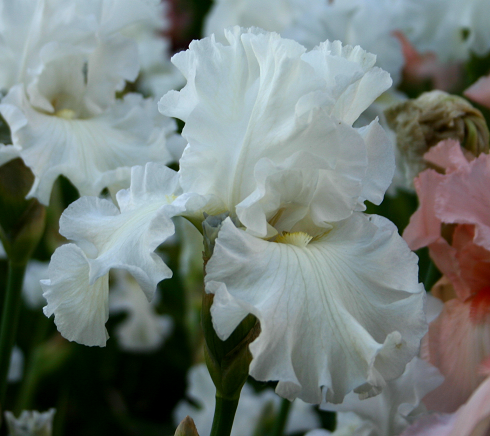 This iris is one that has attracted me ever since I first saw it as a guest at the Minnesota convention in 2009 – a good grower with a delicate light blue rim on the white falls that makes a perfect clump. 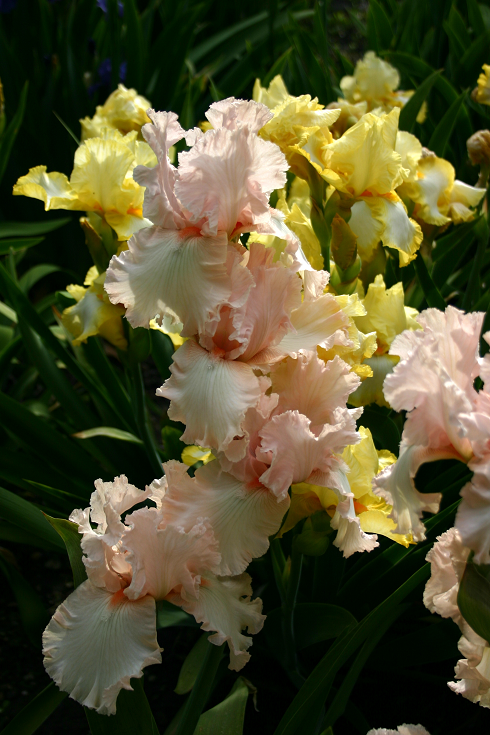 Then came Dean Cole’s “My Girl Emily”, a striking tetraploid with a broad diffuse rim of red around a milky bluish background on the falls – colored rims seemed to get the votes this year. 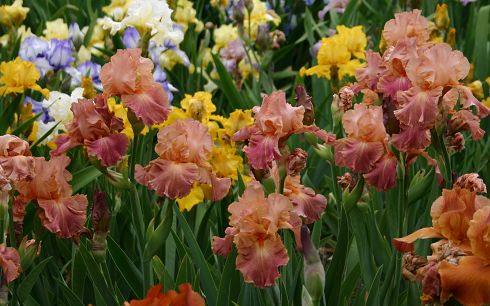 Other favorites in the voting included Marty Schafer and Jan Sack’s “Sandy River Belle”, a subtle blend of sandy yellow and pink that presented wonderful flower bouquets in several gardens. 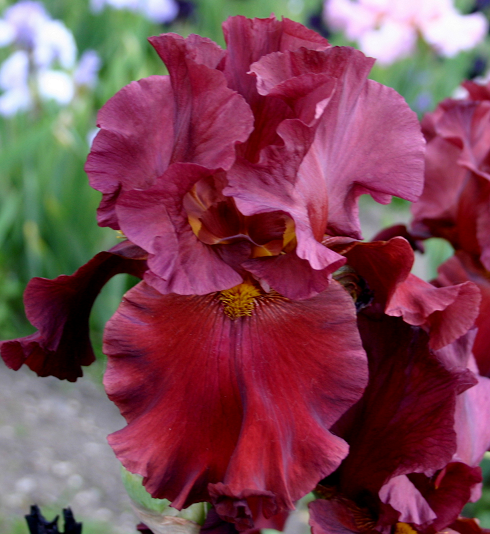 As I said, the competition was extreme – “Trip to Paris” (Schafer-Sacks, 2009) was just one of the many irises that didn’t get on the favorites list but by any measure must be judged to be quite outstanding. 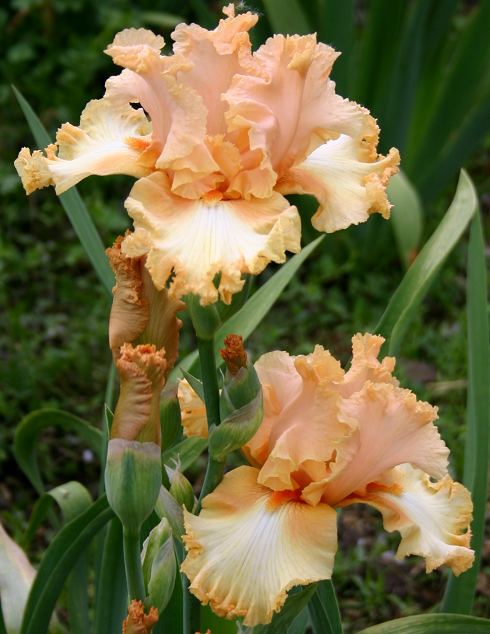 The attendees also voted for the best seedling among the guests. 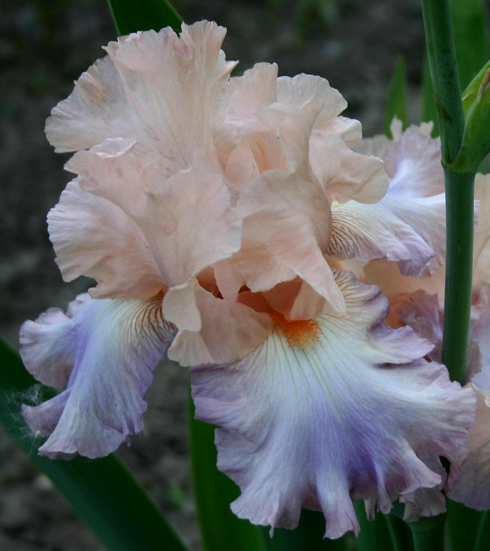 The winner was a bit of a surprise, particularly to Brian Wendell, a hybridizer relatively new to the Siberian world, who seemed to be walking on air when he went up to accept the award. 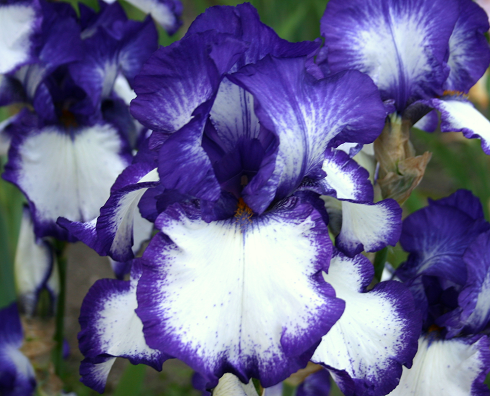 His seedling 2-02 was a very vigorous grower in a classic form with pure light to mid-blue flowers. 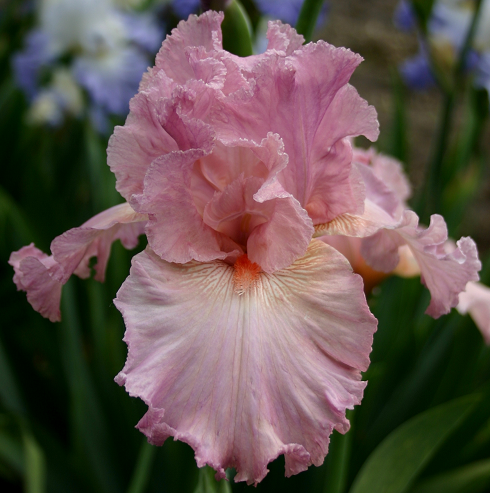 The runners up were Dana Borglum’s Seedling 22 (mid-blue with a large yellow patch on the falls) tied with Schafer-Sacks S04-22C-10 (yellow-brown base with reddish eyelash veining on the falls). I hope all three will be introduced soon. 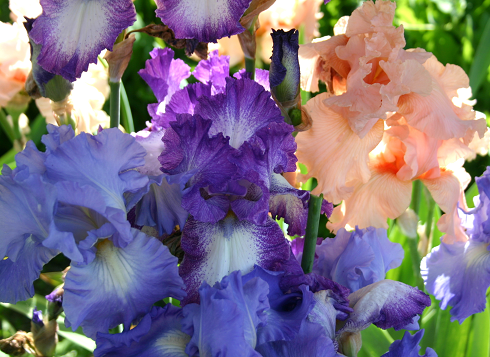 So, it all had to end, we wished our friends, old and new, goodbye, and we garden owners could decompress and bask a little in the glow of an event that went well. Probably it will not recur in Michigan again until the memories of the work and worry of running a convention have faded a bit, but now we can look forward to a new Siberian Convention added on to the AIS Meeting in Portland in 2015. May they be as fortunate there as we were.